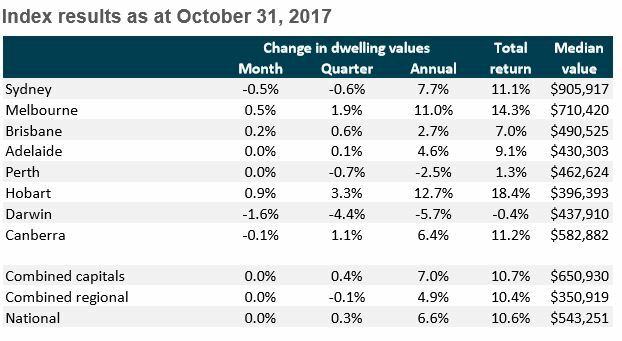 Since moving through a peak rate of growth in November 2016, capital gains across Australia’s housing market have been losing momentum, with national dwelling values unchanged over the month of October. For October, conditions were flat across both the combined capital cities and the combined regional areas of Australia, however over the past twelve months growth in the capital cities (+7.0%) has outperformed the regional areas (+4.9%). The slowdown in the pace of capital gains can be attributed primarily to tighter credit policies which have fundamentally changed the landscape for borrowers. Lenders have tightened their servicing tests and reduced their appetite for riskier loans, including those on higher loan to valuation ratios or higher loan to income multiples. Additionally, interest only borrowers and investors are facing premiums on their mortgage rates which are likely to act as a disincentive, especially for investors who are generally facing low rental yields on investment properties. In fact, the peak rate of growth in dwelling values lines up closely with the peak growth rate for investment lending in late 2016. We saw the housing market respond in a similar fashion through 2015, and the first half of 2016 as investors faced tighter credit conditions following the announcement from APRA that lenders couldn’t surpass a 10% speed limit on investment lending. Of course, housing market conditions rebounded swiftly through the second half of 2016 once the investment related credit limits were achieved and the cash rate was adjusted lower in May and August last year. Sydney joins Perth and Darwin as the only cities to record a fall in dwelling values over the past three months. 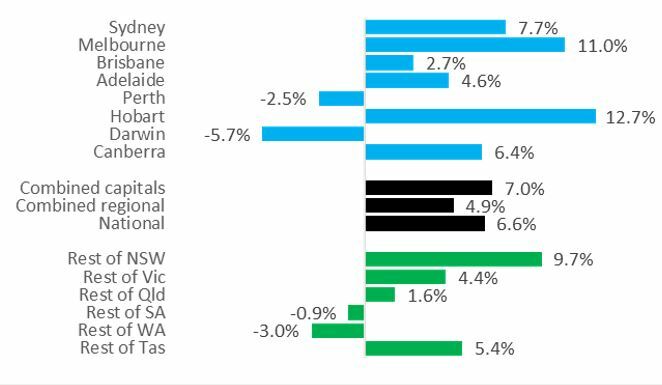 While most of the broad regions are experiencing a slowdown in the rate of capital gains, only three capital cities have recorded a negative movement in values over the three months ending October: Sydney (-0.6%), Perth (-0.7%) and Darwin (-4.4%). Seeing Sydney listed alongside Perth and Darwin, where dwelling values have been falling since 2014, is a significant turn of events. This is the first rolling quarterly fall recorded in Sydney dwelling values since May 2016, when the first round of macro-prudential changes were still working their way through credit policies, and mortgage rates were only just starting to reduce in line with the first cut to the cash rate. Despite the recent downshift in values, Sydney dwelling values are up 74% since the growth cycle commenced in early 2012. Melbourne conditions remain resilient relative to Sydney. For Melbourne’s housing market, conditions have remained much stronger relative to Sydney; dwelling values were 0.5% higher over the month to be up 1.9% over the rolling quarter. This resilience is attributed to Victoria’s record breaking migration rate, which is creating unprecedented housing demand. Additionally, strong jobs growth and a healthier level of housing affordability relative to Sydney are also supporting continued growth in housing values in Melbourne. Despite the stronger growth profile, Melbourne dwelling values are now rising at their slowest quarterly pace since mid-2016. While market conditions in Sydney, and to a lesser extent, Melbourne, are easing, other markets are showing very different trends. Hobart continued to be the strongest capital city, with dwelling values pushing 0.9% higher in October, to be up 12.7% over the past twelve months. 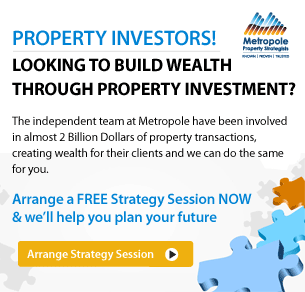 Hobart is benefitting from renewed housing demand in the form of interstate migration, particularly Sydneysiders and Melbournites who appear to be utilising their enhanced wealth positions to buy very well in Hobart, where housing prices are substantially lower than those in Australia’s largest cities. 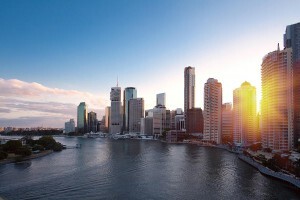 The trend in Brisbane and Adelaide has remained relatively subdued, with Adelaide dwelling values unchanged in October, while Brisbane values were only 0.2% higher. 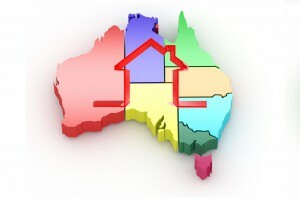 On an annual basis, dwelling values are only 2.7% higher across Brisbane and 4.6% higher in Adelaide. 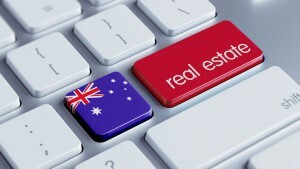 The two toughest real estate markets, Perth and Darwin, are showing a further divergence in their performance. Perth dwelling values moved sideways over the month, however the annual rate of decline has slowed from -4.9% in August last year to -2.5% over the twelve months ending October 2017. The trend in Darwin hasn’t been as encouraging, with values slipping -4.4% lower over the past three months to be down -5.3% over the past twelve months. The correction across Darwin’s housing market has now surpassed 20% since values peaked in May 2014. 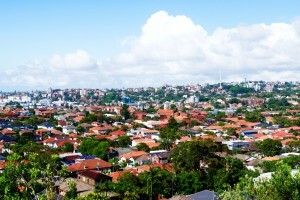 Unit markets generally underperforming relative to houses, except in Sydney. The performance across product types is very different from city to city. 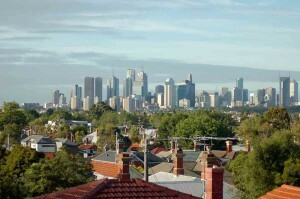 Some cities, such as Brisbane, Adelaide, Darwin, Canberra and to a lesser extent Melbourne, are showing a substantial performance gap between houses and units. The under performance of the unit sector in these cities likely relates to higher supply levels relative to demand and less challenging affordability constraints which is supporting demand across the detached housing sector. The Sydney unit market is slightly outperforming the detached housing sector, with an annual growth rate of 7.9% for units compared to a growth rate of 7.7% for houses. While Sydney is seeing a large number of new units added to the market, it seems that high levels of investment activity and strained affordability is helping to drive a better performance across this sector. 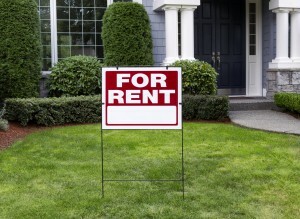 Rental conditions improving but yields remain low. 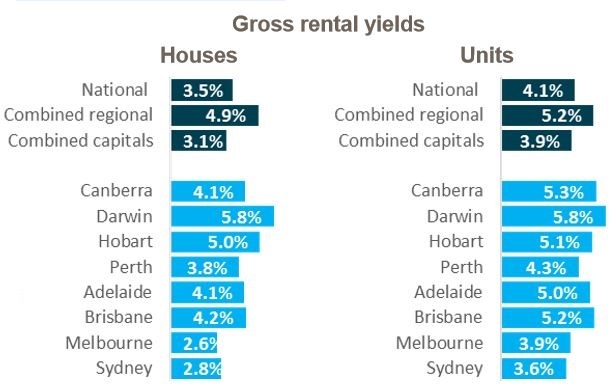 While the pace of capital gains has slowed across most regions, some momentum is gathering across rental markets, however, rental growth has not been high enough to reverse the downwards trend in yields. The national annual pace of rental growth has lifted from 0.9% a year ago to 2.8% over the most recent twelve month period. Considering national dwelling values were 6.6% higher over the past twelve months and rents rose by 2.8%, yields have compressed further over the past year and generally remain at or close to record lows in most cities. 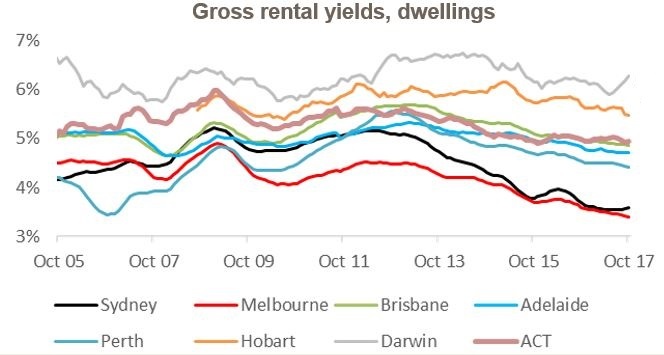 The two exceptions are Sydney and Darwin, where yields have shown a subtle improvement over recent months, due to dwelling values underperforming relative to weekly rents. If the Sydney property market continues to see values slip lower while rents gradually rise, yields will repair, however a recovery in rental returns is likely to be a slow process. Gross rental yields across Melbourne remain the lowest of any capital city, with the typical dwelling attracting a gross yield of 2.89% (record low) which is 20 basis point lower than a year ago. To provide some context about why rental yields have compressed so much, over the growth cycle to date, Melbourne dwelling values are up 58% while weekly rents have only increased by 15.5% over the same time frame. Regional NSW is now showing a stronger growth trend than Sydney: Outside of the capital cities, the regional area of New South Wales is showing the strongest growth conditions. Dwelling values across regional New South Wales are now outperforming Sydney, with values up 9.7% over the past twelve months. The strong regional growth is being led by the Newcastle and Lake Macquarie region (+14.6%) and the Southern Highlands and Shoalhaven region (+13.6%). Regional Tasmania recorded the second highest annual capital gain at 5.4% followed by Regional Victoria as 4.4%. Growth has rippled away from the Sydney metro area as affordability challenges constrain demand. Buyers are attracted to the lower price points and lifestyle opportunities of the adjacent areas where commuting is still an option. Regional Western Australia (-3.0%) and regional South Australia (-0.9%) were the only ‘rest-of-state’ areas to record a fall in dwelling values over the past year, while regional Queensland dwelling values were up 1.6% and regional Northern Territory saw values rise 1.3%. 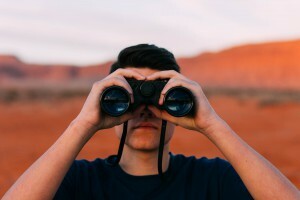 Financial markets have pushed expectations for a cash rate hike out to early 2019, implies that mortgage rates aren’t likely to rise materially over the foreseeable future. With household debt at record highs, higher mortgage rates would test already stretched household balance sheets. Labour markets have strengthened and population growth is underpinning housing demand, set against a backdrop of limited detached and semi-attached housing supply. On the other hand, the future prosperity of the high-rise unit sector is less certain. 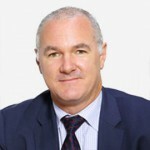 New unit projects that are positively differentiated and/or more geared towards owner occupier target markets rather than pure investment grade stock are likely to show a better performance. Historically, sustained growth cycles have generally been followed by a period of negative growth, so a further reduction in dwelling values should not come as a surprise. While the weaker Sydney housing market is dragging headline growth rates lower, there are a variety of factors that are likely to support a soft landing across Australia’s housing market.